Bring a refreshing feature to your decorative space with the use of this traditional rectangular wall mirror. Decorated with an antique gold leaf iron frame, this traditional rectangular wall mirror boasts dignified charm and elegance. The beveled mirror glass enhances the refined style and modern personality in the appearance. This mirror can be easily installed to hang vertically to bring a bold presence to any decor. 28" wide x 49" high x 6" deep. Hang weight is 17.7 lbs. Glass only section is 12 1/2" wide x 39 1/2" high. Surrounding frame is 7 3/4" wide. Traditional rectangular wall mirror from Global Views Bamboo Mirror collection. Vertical installation only. Hangs on two keyholes. Antique gold leaf iron frame. Beveled mirror glass. 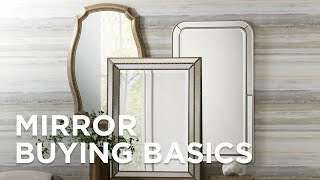 Is the actual mirror only 12" wide because I don't see how it adds up to 28" wide? BEST ANSWER: Hi Cheryl - the dimensions are correct per the manufacturer.